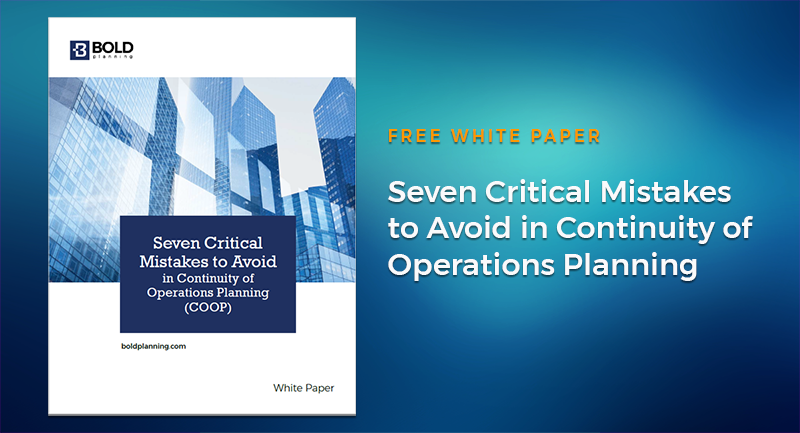 FREE WHITE PAPER: Seven Critical Mistakes to Avoid in Continuity of Operations Planning (COOP)-Download – BOLDplanning Inc.
Is your Continuity of Operations (COOP) plan as good as it can be? Many organizations still do not have a formalized Continuity of Operations Plan (COOP). Or, if they do, it’s gathering dust in binders on a shelf. In this BOLDplanning white paper, you’ll learn seven critical mistakes often made in the COOP process. Don’t let these mistakes affect your preparedness. Download this free paper now.